YES: if you want to learn to cycle faster, especially for events like the Haute Route, the Marmotte or the Etape du Tour. YES: if you want to experience the charm of the Canary Islands, well away from the main tourist centres. NO: if you prefer the lifestyle associated with large hotels and easy access to bars, nightclubs etc. The roads in Tenerife are generally in excellent condition and the weather much warmer than elsewhere in Europe in February. The rides are appropriate for the time of year, including a mix of both short and long climbs and descents at different gradients. The pace is at an easy, base-miles endurance level. Different groups will form so that you ride with people at your own level. You can always ride harder if you wish, and the coaches will help you define your own training camp objectives and daily pace. The coach to rider ratio is 1:5 or better, ensuring that you will have plenty of one-on-one coaching. Time to relax in wonderful, authentic surroundings. Enjoy a coffee and pastry in one of the numerous local cafés. Here is the programme for the week, including the coaching focus for each day, the major climbs and the distance/elevation you can expect to ride. You will be picked up at the airport and taken to the hotel. Depending on your arrival time, you may wish to have a late lunch in the village or set up your bike immediately and go for a short check-out ride. The camp begins with a welcome drink and briefing at 18:30, followed by dinner in a local restaurant with the coaches and other riders. We begin the week with a warm-up ride on the flat, during which the coaches observe your basic bike-handling, cornering and group riding skills. Next we tackle the first climb, 8.5km and 500m from Garachico up to San José. We observe and video your pedalling technique during a 10 min power test on this climb, gaining useful data for the week. At the top the group divides and the faster riders take the longer route with an extra 200m+ climbing via la Montañeta. 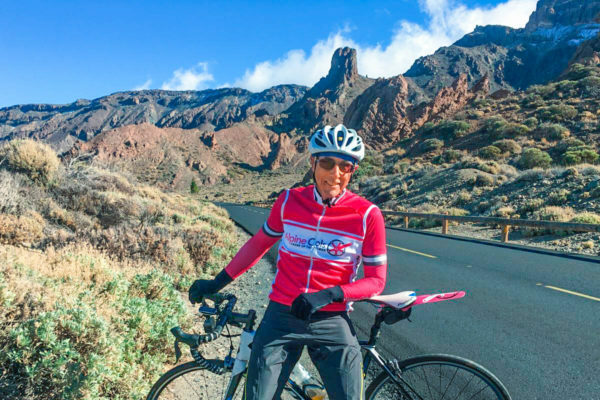 There’s an opportunity for a coffee stop in Santiago del Teide before we make the steep descent to Masca, the first chance to see your descending skills. Enjoy extraordinary views across the mountainous NW corner of Tenerife to the nearby island of La Gomera from the lookout point at El Mirador del Baracan, before an exhilarating descent back for a buffet lunch at the hotel. Descending is a crucial skill to master if you are going to race in the mountains. Our goal today is to help you make a big improvement in your ability to descend fast and safely. After the usual warm-up, we will begin by climbing to El Palmar, from where we will practice descending. Each rider will descend multiple times with a coach and be videoed multiple times. This will enable us to provide immediate feedback, and the video will allow you to observe your own technique. If you wish, you can use the van as a convenient way to climb quickly back up the road without unduly tiring yourself by repeated climbing. There is a nice café for a coffee stop before we make a final descent back for lunch. For a final ride in the Garachico area we will do the classic loop via Masca and Santiago del Teide from the west. This route involves 2,300m of climbing. The climb out of Masca, in particular, is very steep, averaging 11% for 2.5km but with ramps at 18-20%. The focus today is on climbing technique and pacing. We look at your seated pedalling technique and how it varies between the moderate and steep pitches, and we look at your standing technique to help you “dance” on the pedals like a pro. We also pay close attention to your pacing to ensure you stay in the right intensity zone for a long endurance ride in the mountains. There’s an option to extend the ride if you feel it is too short. Today we change location and make the first of three climbs to Mount Teide, the famous Tenerife volcano. For the next three days we will very likely encounter professional riders, here to do big blocks of winter training. After the now familiar climb to El Tanque and Santiago we enjoy a short descent before the long (26km) climb to the volcano. The total climb is 1,300m at a fairly steady gradient, rarely more than 7%. This is a day where it is essential to get the pacing right, especially in view of the two days still to come. There’s a great opportunity to practice descending skills on the 25km descent to our new base in Granadilla. Your luggage will be transferred to the new hotel and be ready and waiting for you when you arrive. This is the Queen stage: the opportunity to put it all into practice on the longest continuous climb in Europe! We climb from sea-level to the lip of the volcano. The total climb amounts to almost 2,200m, over 35km. If the complete climb is too much for your current level of fitness, you can start climbing directly from the hotel in Granadilla, saving yourself the first 650m from sea-level. If you still have the legs for it, we will cross the crater and go on to the highest point (2,350m) 15km further on, passing in front of the Parador hotel used by the pro teams to sleep at altitude. Today’s coaching focus is specifically on nutrition for long rides. Friday is definitely the highlight of the week, as we ride over for a very special home-made Canary Islands lunch at Marcos and Alberto’s family house. On this final day, we will visit new roads as we ride around the eastern side of the island and climb over Mount Teide from the north-east. The first part of the ride is a wild roller-coaster up and down and round a never ending series of corners as we (more or less) follow the contour line to the north. It is a wonderful road and a great opportunity to put everything together in a well-paced group. Today’s easier option is to miss out the first 20km. The climb is 30km long, rising 2,000m. It is a fitting way to finish. The transfer back to the hotel after lunch is by minibus. Departure day! If your flight is late enough, you may be able to fit in a last, early-morning spin. For most, though, it will be an opportunity to enjoy a relaxed Canary Islands breakfast in the beautiful Hotel Rural Senderos de Abona before packing up and leaving for the airport. We have deliberately chosen two small, historic hotels that are as different from the mass-market tourist hotels as possible. Both the Quinta Roja and the Senderos de Abona are full of character, affording us the authentic Canary Islands experience. We will take our meals either at the hotels or in small local restaurants where they know how to feed hungry cyclists with delicious local dishes. Firstly of course it was the best training camp I have ever been to. The things that I found were best for me, were the climbing technique work with Silas and the information on power from Bryan. Learning about Polarized training was very good. The choice of hotels was perfect, Garachico being my favorite, I really enjoyed the 2 routes through to Masca. Thank you for a great week of training under difficult circumstances you and your team did a fantastic job. This was a great camp and a good start for my training this year. Really everything was well done. Coaches corner, Verve information on power, rides, coaching assistance on rides, local guide group was great. On-the-road support vehicle with free energy drinks and snacks, spare wheels and space for extra clothes etc.